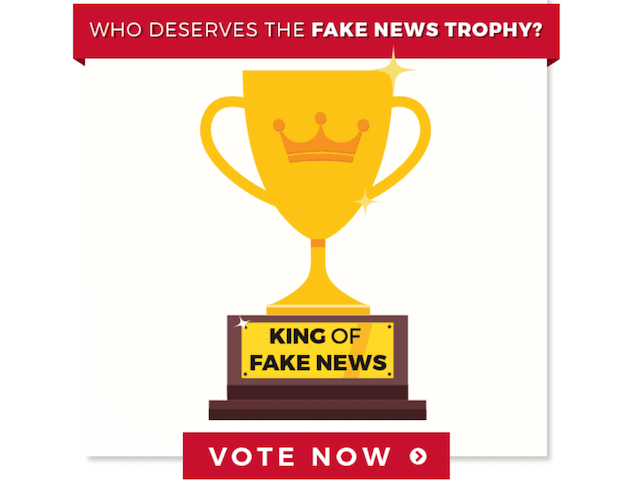 President Donald Trump’s campaign committee is asking supporters to help them award a “fake news” trophy. The nominations include false reports from ABC, CNN, and TIME magazine. “Americans are sick and tired of being lied to, insulted, and treated with outright condescension,” the email says. The FAKE NEWS has utterly abandoned their duty to fairly report the news to the American people. Some journalists and liberal pundits think that Americans are too stupid to see through their amateur efforts to manipulate public opinion, but THEY’RE WRONG. The Trump Make America Great Again Committee is a joint fundraising committee authorized by and composed of Donald J. Trump for President, Inc. and the Republican National Committee.